How much money do you truly think those jerseys generate? The Chinese market is a huge part of our team and even recruiting plans when we make our presentation to respective free agents. You can tell a boom free agent that thanks to Yao the Rockets have a huge following and revenue in that market which can also be beneficial for that said free agent as well. How did he sell jerseys when it says Houston on it ? DonKnock and MettaWorldPete like this. Why do you think he mentions NASA? Why are they called the Rockets and the baseball team called the Astros? Could it be where the space program is located ? Do you even know why Houston is called Houston ?!! Miami Vice is dope though. Name me one Houston landmark..
"Be Someone", San Jacinto monument, transformer looking Memorial Hermann hospital on ih10 going West, the Saturn V, the water wall in the galleria, the Katy rice factories, the ASTRODOME. And me personally I love the building downtown that looks flat like paper from most angles. There's alot of landmarks. Were you trying to make a point that there are none, or that we could use one of many? Houstunna, macho GRANDE and Astrodome like this. BigggReddd, MJ19 and macho GRANDE like this. Thanks THADDEUS, Leslie & Tillman. This is the only court you can see more chinese than english. I caught up today with some nba games from around the league I had missed, and the difference is striking. Our nba court looks like its in china. No other nba court is like that. It makes me sick. 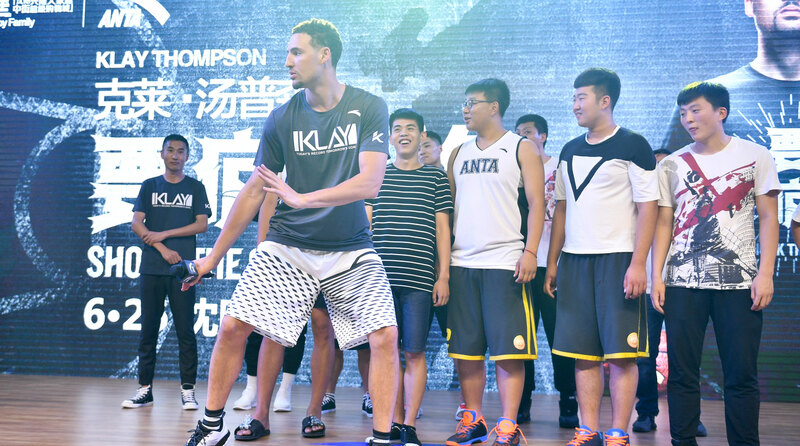 What a difference our chinese court makes to every other nba court. Disgusting. Chinese chair backs, court, baskets, jerseys. Caesar and tinman like this. "I want to paint a mural of Houston for the kids, but I'm terrible at drawing swamp humidity." I was under the impression that the black “Houston” jerseys were originally intended to be the Rockets “city” edition. The Rockets, however, wanted to wear these jerseys much earlier into the season and also more often. (“City” edition jerseys can only be worn for. Limited number of games for a limited time). So they switched the Chinese jerseys to the “city” edition so they could wear the black ones more often. I’d like to think most of us support that decision. Kam and amaru like this.